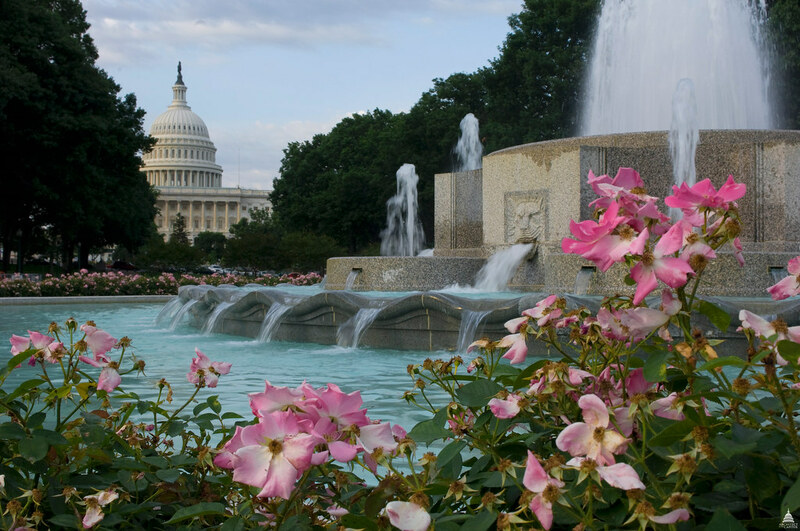 The display fountain in the park between the U.S. Capitol and Union Station is located over the Senate underground garage. Authorization for its construction, for that of the terraces, and for landscaping was given on March 4, 1929. The fountain was designed by architects Bennett, Parsons and Frost and built under the direction of Architect of the Capitol David Lynn. It operated for the first time on July 16, 1932. The senate fountain, a hexagonal granite monolith with high jets of water spouting from its center, is surrounded by six smaller jets on a lower level. Lion-head spouts on the faces of the hexagon project streams of water into a large circular basin with a scalloped stone rim, over which the water spills into a larger oval basin. The hexagon is 25 feet across and the basin measures 85 feet by 100 feet. From the oval basin the water is piped underground to three sculpted stone bubbler fountains in the north wall of the terrace. The scalloped rims of their tiered basins repeat the pattern of the large fountain above. From there the water is again piped underground to the lower level of the 180-foot-by-80-foot reflecting pool. The present lighting display is comprised of 114 underwater light fixtures with red, green, blue and clear lenses controlled by a computer running a program that repeats every 20 minutes. This system began operating on July 4, 1980, replacing the original lighting, which had been in use for nearly 50 years. The lighting system is energy efficient because the lights are not on at full intensity at all times. The use of solid-state dimmers eliminates the need for frequent maintenance. Safety features include an automatic shutoff activated by the water level dropping below the surface of any light fixture or by a ground current rising above 5 milliamps; thus, any danger of shock is removed. Recirculating pumps ensure water conservation, and fresh water is added occasionally to replace any losses. The mechanical equipment for operating the fountains is located directly under the main fountain. The water is circulated by pumps, passes by gravity through a 24-inch cast-iron pipe to the lower fountains, and then flows to a concrete 30,000-gallon surge tank under the section of the terrace containing the bubbler fountains. The water from this tank is returned to the circulating pumps. Of the three circulating pumps, two have a capacity of 3,000 gallons per minute; the other can pump 1,650 gallons per minute. It is possible for all pumps to discharge against a 40-foot head. The main fountain is fabricated of Minnesota Pink granite, with a basin of Minnesota Green granite. The piers and other granite elements facing the Russell Senate Office Building terrace are made of Mount Airy granite, which blends visually with its surroundings.